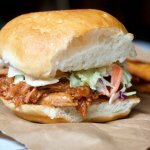 How a pork barbecue sandwich is supposed to taste! An easy recipe (10 minutes or less) that's perfect for a backyard BBQ or summer cookout. Can be made gluten free. Remove Curly's BBQ from package and warm in a skillet over medium-low heat. While BBQ heats, add mayonnaise, juice of one lemons, vinegar, and sugar to a small mixing bowl and whisk together until well incorporated. Add fresh cole slaw veggies to mixing bowl with dressing and toss to coat. Layer buns with a generous helping of Curly's BBQ and top with cole slaw.